Singapore firms tapping 3D printing tech for new growth opportunities ? Tissue implants customised for individual patients and a more cost-efficient way of producing hybrid solid rocket fuel – these are some of the joint industry research projects that are in the National Additive Manufacturing Innovation Cluster’s (NAMIC) portfolio. In a joint media release on Monday (Jan 23), the Nanyang Technological University (NTU), the National Research Foundation and SPRING Singapore gave an update on NAMIC since it was formed last year to help companies develop capabilities in 3D printing. 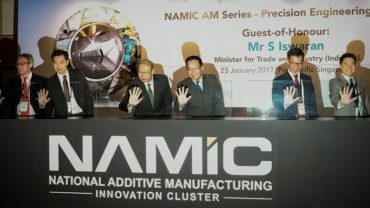 It has successfully established joint funding for 39 projects between companies and academic research institutions, with S$3.8 million from the Government via NAMIC and S$2.8 million from the companies, Dr Ho Chaw Sing, managing director of NAMIC, told Channel NewsAsia in an interview on Monday.